The compressor is often seen as a bit of a mysterious effect. I will try here to enlighten those of you who think “why the heck should I be using a compressor?”. You will also find below a video demo showing what a compressor does to your guitar tone. You have first to understand a little bit about how a compressor works. Compressors originated in studios as sound reinforcement tools. They are probably the most used studio processors after equalizers and reverbs. What they do is “reduce the dynamics range of a signal” i.e. the difference between the softest and loudest volumes. In simpler terms, when you feed a signal to a compressor, be it vocals, drums, guitar or bouzouki and the volume of this signal is louder than a “threshold”, the compressor will make it softer. The amount of reduction is governed by a setting called “ratio”. In that respect a compressor can do what a limiter does, there is a quite loose difference between the two. The original use of compressors was to avoid distorting recordings or radio emissions. But a compressor can also have the effect of augmenting the sustain by increasing the volume as the signal fades out (this is very useful with a guitar, more on that later). Beside “threshold” and “ratio” settings, there is also usually an “attack” setting (how fast the compressor kicks in) and a “release” setting (which can increase the perceived sustain). I will not really go into more details as this post is guitar oriented and studio compression is a very vast subject. Nevertheless, know that compressors are used in studios on almost every instrument as well as entire mixes to add punch, clarity, smoothness, more perceived volume, etc. If you are serious about making your own recordings, you will have to master the art of compression (see this MIX magazine article for further reference). It is indeed quite an art to find the correct compression settings on studio compressors so that the sound does not appear too compressed i.e. so that the use of compression is transparent. On extreme settings, it will become more like an effect than a transparent sound reinforcement tool. It will generate a “squashed” sound which happens to sound pretty good with a guitar. This is why effect manufacturers have put compressors into pedals, fortunately with simplified settings compared to their studio counterparts. They are also adapted to the dynamics and frequency range of a guitar and would not compare to their more versatile studio cousins in terms of sheer audio quality. The most famous of all compressors for guitar, the MXR dynacomp, has only two settings: output volume and “intensity” which controls the amount of compression. The more you turn it clockwise the more your tone will sound “squashed”. Where do I plug a compressor in the effect chain? It usually goes at the beginning of the chain before overdrive and distortion effects. You can refer to my previous post about effect placement. If you look at a multi effect unit, you will actually see that the compressor is often first in the chain. I have also written a previous post about the unconventional use of a guitar compressor at the end of the chain in a recording situation. And what does a compressor do to my guitar tone? Used with a clean tone, a compressor will give you a bit of a “clicky” tone with lots of sustain. David Gilmour of Pink Floyd has been a long time user of compressors to get more sustain on his clean tone. He has used an MXR Dynacomp for a long time and is now using a quite expensive Demeter Compulator. Country guitarists make heavy use of compressors for their fast clean licks, adding an almost liquid quality to them. Funk and pop guitarists also use them to give some edge and volume consistency to their rhythm guitar runs. Used before a distortion or overdrive, a compressor will be harder to notice as these effects already feature quite some natural compression. Nevertheless, a compressor can bring more sustain and fatness. Be careful about one thing though, by their very nature, compressors tend to add some hiss. 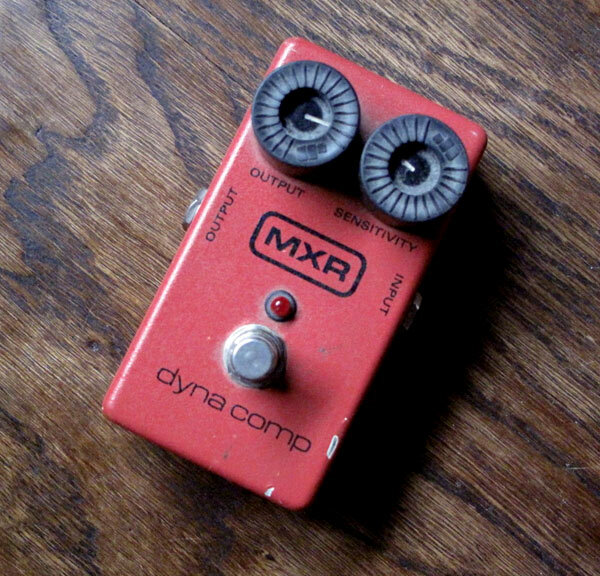 The MXR Dynacomp is a very common compressor and was used by almost everybody in the 70s/80s including David Gilmour. It is still widely used by pros today. MXR sells two different versions: the modern one and the 76 reissue. The latter is a limited run and is meant to be closer to the early Dynacomps (and also unfortunately lacks a LED). I personally own a “modern” one from 1995. The Dynacomp is neither the most silent nor the most hi definition piece of gear but it has real character which is why it is so popular. Mine tends to be a bit bassy also which means the tone gets quite fat. The BOSS CS-3 is a quite clean compressor but does not have much character in my opinion. I had mine modified with the Opto plus Monte Allum modification and it has turned it in an almost studio grade compressor. Electro-Harmonix has several compressors in their line-up including the tube based Black Finger and the compact Soul Preacher. The Keeley Compressor is effect guru Robert Keeley’s most popular pedal. This boutique compressor has quite a following now. The Analogman mini-Bicomprossor is another powerful boutique pedal featuring two compressors in one (I don’t have one but it is no secret I am a big fan of Analogman’s stuff so it must be pretty awesome). The Demeter Compulator is another high end compressor pedal, notably used by David Gilmour after he ditched his Dynacomp. This is not by any stretch an exhaustive list as virtually every pedal manufacturer has at least one compressor in its range. Hopefully this post will encourage you to experiment with compressors. There are numerous compressor pedals on the market and every multi-effect includes a compression effect. They are especially useful to get that “clicky” clean sound for country licks and funky rhythm parts or placed before a distortion to increase the sustain and fatten things a bit. But I find they can also be very useful in recording situations especially when you cannot crank an amp or when you have to record direct. After all, compressors were not primarily invented to be guitar effects but they originated in the studio and are used in recording and mixing situations all the time, not only to avoid distortion but also to put forward some parts, smooth a bass line or increase the sustain of a guitar part, etc. The list of applications is endless. So, a while ago, I was recording direct using my trusty Marshall JMP-1 preamp and I was using the clean channel with my pedal board laden with overdrive, distortion, delay, etc. in front of the preamp. I found the tone to be a bit static and unrealistic. I then decided to try using a compressor, a BOSS CS-3 modified with the Monte Allum opto plus mod, in the effect loop of the JMP-1. So yes that means that all my other effects were placed before the compressor kicked in. This is counter intuitive for guitarists as you are always told to put a compressor first in the chain but sometimes rules are meant to be broken. Note that some guitar compression pedals are not exactly studio grade so results may vary but I was quite satisfied reproducing the same trick with a standard MXR Dynacomp, the compressor of all guitar compressors (my model has nothing fancy, it is unmodified and was made in 95). The resulting tone was more realistic and lively be it clean or colored by overdrive or distortion pedals. The difference is subtle but, to me, having a bit of compression at the end of the chain mimics the natural compression of a clean but loud tube amp. I have recorded a demo using my Fender Stratocaster equipped with noiseless Kinman pickups, a RAT 2 distortion and a BOSS DD-3 Delay into a clean Marshall JMP-1 plugged directly into the sound-card (an EDIROL FA-66). This is not bad but not very smooth. I find that it is smoother and has more sustain. I also find that harmonics come out better. Even smoother… The Dynacomp had the output on 3 o’clock and the sensitivity quite low, on 10 o’clock. The CS-3 had the following settings: Level at 3 o’clock, Tone at 10 o’clock, Attack at 10 o’clock and Sustain at 11 o’clock. So girls and boys, just experiment and try to put that compressor at the end of the effect chain especially after a modeling or tube preamp if you record direct. I also suspect that a low volume amp could benefit from having a good compressor in the effect loop.